Apple is coming out with a patch soon for Snow Leopard to fix this issue. In the mean time, don’t click on any strange links, turn off “Automatically open safe files” in Safari and other browsers, and delete anything you don’t remember downloading. So as of recently, there has been a lot of talk in the Mac world about the malware that has been biting Mac users. 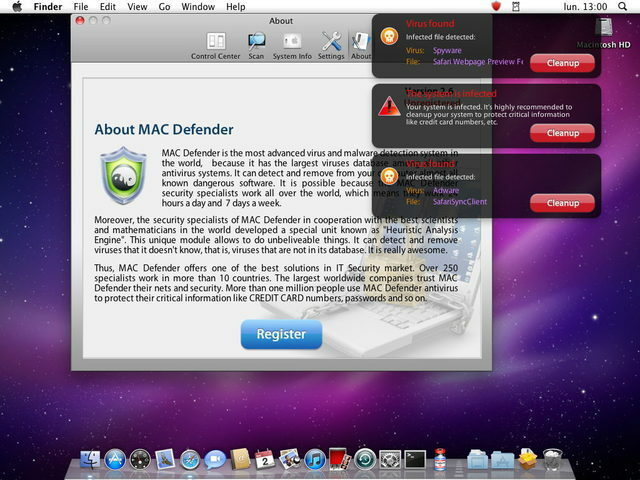 I mentioned this in a post about a week ago, the name of it being "Mac Defender" (the irony), and now it has gone under the names of "Mac Protector" and "Mac Security". Most people have been talking about the malware and how to remove it. I’ve always mentioned not taking chances with the security on a Mac, even using anti-virus apps myself since day one. So the next few posts are going to be over how to keep your Mac secure. I’ll be covering it over several videos, as well in my regular posts. I likely won’t mention how to remove the virus unless specifically asked to. If you have any questions or suggestion about security on a Mac, feel free to comment, email me me at easyosx@live.com, or send me a tweet @EasyOSX. The topics will cover Mac’s built in security, securing your 3rd party apps (browsers, etc) and other security-centric Mac apps. Thanks for reading, and safe computing. Tags: Mac, Snow Leopard, Leopard, MacDefender, Defender, MacSecurity, secure, security, MacProtector, anti-virus, malware, virus, EasyOSX, easyosx, firewall.